Each year millions of tons of plastic waste pollutes our ecosystem and kills thousands of animals. Plastic pollution is our planet’s defining challenge and the focus of this year’s World Environment Day. On June 5, we join the UN and hundreds of countries in the effort to Beat Plastic Pollution. If offered plastic cutlery with your takeout meal, just say “no, thank you,” and keep your own reusable utensils on hand. When shopping, bring along a reusable bag, or skip bagging altogether. Packing a picnic? Don’t forget the reusable cups, plates, forks, and spoons. Be flawless and go strawless! Rather than using a plastic straw, opt for an eco-friendly equivalent made of stainless steel, glass, paper, or bamboo. Cigarette butts are the most common form of plastic waste found in the environment, and are made from a non biodegradable plastic called cellulose acetate. You’ll breathe easier by kicking the habit, and the environment will thank you. In addition to plastic lids and stirrers, to-go coffee cups contain a plastic lining that makes them difficult (if not impossible) to recycle. Travel mugs come in a variety of materials made to withstand many, many refills, and your local coffee shop may even offer a discount for getting your joe in a reusable container. Curbing plastic waste requires behavior change from everyone — consumers, manufacturers, and governments. 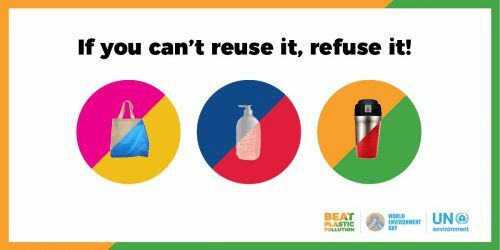 Encourage your friends, family, and colleagues to join your fight to beat plastic pollution, and help drive consumer demand that enables change. Although there’s not a single solution for solving our single-use plastic problem, given the magnitude of its impact on our planet, it’s important that we all take steps to reduce our dependence. Read the UN’s State of Plastics report, and stay tuned this summer as we’ll share an exciting opportunity to help you make small changes that make a big impact on the environment. This article originally appeared on Southface's blog on June 4, 2018. It has been edited for clarity and content.